If you’re anything like me, you either love cooking but your knife skills aren’t iron chef worthy, or you just want to simplify your life and get the daily cooking out of the way as quickly as possible. I sometimes flip-flop between those two feelings, but one thing remains the same: when I want to chop nuts, using a knife sends a cold shiver down my spine. I haven’t cut myself deeply with a kitchen knife yet, and I would love to keep it that way. Before we dive into figuring out how to choose the best nut chopper for you, we should consider if you really need one or not. Do You Need A Nut Chopper? So, what other options are out there? If you’re a magician with a knife, then a knife is the quickest and easiest method of slicing and dicing any kind of nut. However, for a mere mortal like myself, knife skills are severely lacking. If you’re anything like me, you would need an extra hour just to get everything prepped. Let’s look at nut choppers. We want something sleek and compact, easy to use and a breeze to clean. Do we go electric and have to worry about cords and batteries, or just stick with something you can press to chop with? Let’s dive right in and have a look at a few on the market. 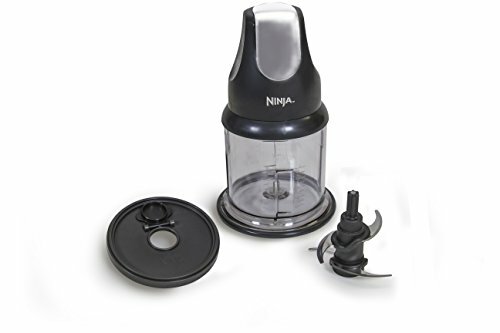 This is a food processor that you could use for mincing up herbs, making dressings, or pureeing vegetables. However, it doesn’t handle nuts as well as it could. Cracks have been known to appear in this chopper, and food gets stuck in the gears, making it difficult to clean. The three bladed Ninja Express chopper seems to puree your food, rather than finely chopping it. Smaller food particles get stuck underneath the blades, leaving larger chunks of food amongst the smaller pieces, so consistency is lacking. This processor is great for when you want mushy food, however if you want finely chopped nuts, then this might not your best choice. Chopping doesn’t seem to be the Ninja Express’s forte, and the lack of strength in the design combined with complicated cleaning puts a few negative marks against it. This cast aluminium grinder with glass jar underneath is adorable! 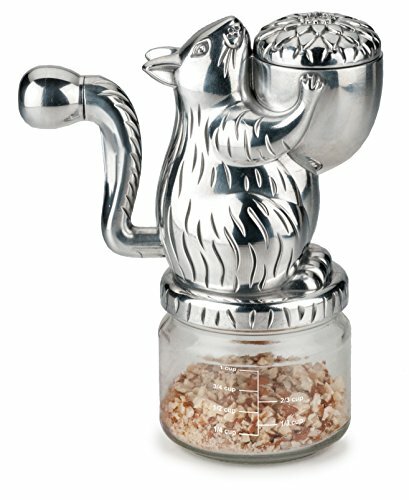 The top is shaped like a squirrel and its tail rotates to grind the nuts. Weighing in at 1.91 pounds, it’s entirely hand driven, which does cause some issues with the tougher nuts. Using brute force to grind could cause damage to the blades, and may also make the top jump off the glass jar. If you don’t mind using some muscle, this could be a good option for you. However, grinding the tougher nuts could cause this little grinder some issues. The price might make this not fully worth-while, but if you want something that’s cute, can grind some softer nuts easily with a little elbow grease, then the RSVP Hazel Nut Grinder could be the grinder for you. If you’d like more of an elbow grease workout, then this chopper could be what you’re looking for. Open the top, fill with nuts, and roll the device to chop and mince your nuts. The good thing about this is that the blade is super easy to remove and therefore wash, which is a bonus. But because of the positioning of the blades, getting them out of your freshly minced nuts could be a little precarious – so use with caution! It’s fully dishwasher safe, so you don’t have to worry about trying to scrub it out by hand. The downside is, if you’re wanting to mince a lot of nuts, this could take a while. The capacity isn’t huge, and there may be some issues with the plastic breaking if you use too much force. Overall, for the price, not a bad device to keep in the kitchen for quick and easy use. 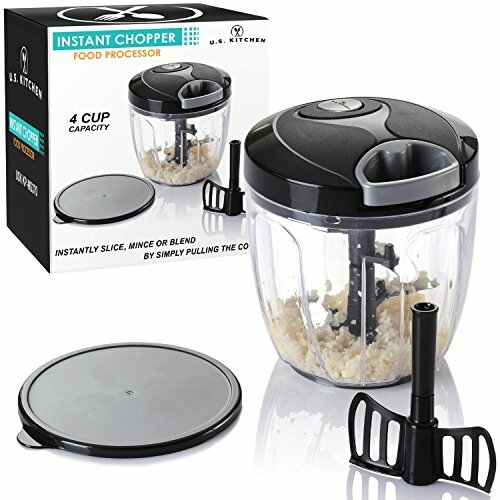 This is another manual nut chopper, but it features a much larger holding container. With a 1.5-cup (350ml) capacity and handy measuring marks on the side, this would make cooking prep a breeze. See also, how many tablespoons in a cup. It has fine and coarse grinding options, with the promised ability to grind harder nuts like almonds. 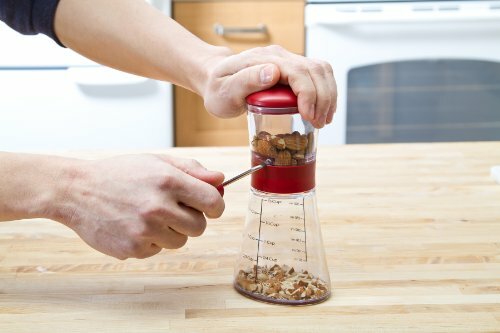 Simply add your nuts, turn the handle until you have the right measurement of ground nuts in the bottom, then unscrew the bottom to pour out the nuts and you’re done. For general home use, it looks sturdy enough. Although, as with any crank nut grinder, breaking the arm or the grinding mechanism is a real possibility and concern. Everything is dishwasher safe, so cleaning is easier than with other nut grinders. The black color option is discontinued, so fire engine red is the only option available. You may not be able to color coordinate your kitchen, but you’ll have the perfect measurements. This model is an electric grinder, so no more muscle power needed. It’s great at grinding spices – the easily removable cup is great for whipping up some spices and sorting them, and the push top is easy to use. The sleek black and silver design will fit in with most kitchen colors. This model does have some issues, however. The motor can overheat and cause problems. It also seems to have a hard time handling tougher nuts due to the weak motor. Also, the blade fitting may not be 100% air tight – some finer spices may been leak out. 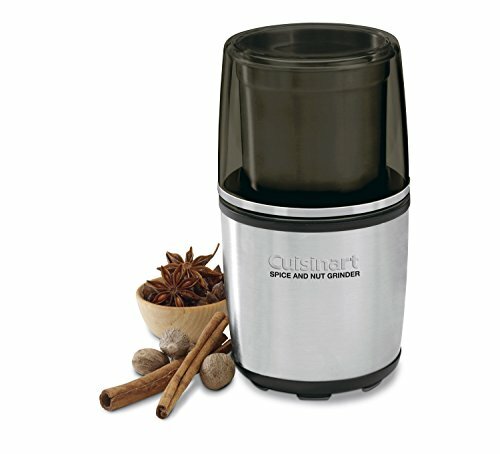 For softer nuts and some spices like pepper, the Cuisinart SG-10 grinder might be an option, but the issues regarding the motor longevity and overall structural design should be taken into consideration. Although the name is a mouthful, this nifty device has a massive range of uses. Pull the cord on the lid and instantly chop, mince and slice anything – from vegetables and fruits to nuts and herbs. The 100% lifetime satisfaction guarantee is a great comfort, providing a full refund if you’re not happy with your purchase. With a huge 4-cup capacity, the bowl and blades are all dishwasher safe, making for easy clean up. Due to the placement of the blades, smaller nuts may struggle to get fully sliced and diced and there is a limit on how fine you can actually go with the mincing. Overall, not a bad product if you want something for not only nuts, but other kitchen slicing duties as well. This Mandoline drum slicer has a sleek retro-style look to it, but at first glance it looks like a fancy grater – perfect for slicing up your potatoes and other vegetables, but nuts? If you want your nuts finely minced, then this would be perfect. However, getting 100% of the nuts to mince is always more difficult with these grater style devices. The suction bottom will make it much easier to use and more stable than a handheld grater. Just don’t expect to go at lightning speeds and have the suction hold tight. You’re not limited by container size, as you can place a bowel under the chute and empty it into a larger container easily, without having to pull apart the slicer. 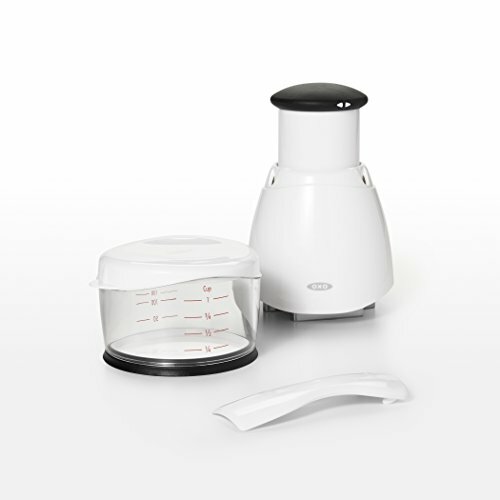 The interchangeable drum blades give you a device that you can use for other foods in the kitchen. Cleaning up is a breeze, with everything being dishwasher safe and easy to clean in the sink. Another compact, non-electric chopper, this model will sit discreetly in your cupboard or on your countertop. It comes in two sizes – the larger version, and a mini chopper. The OXO mini chopper will cut your nuts more finely, so keep that in mind if you go shopping for this product. This device will chop your nuts, rather than mincing them and making them powdery. It’s also great to use on vegetables, so it’s the perfect multi-purpose chopper. The 1-cup capacity container has a lid so you can chop into the cup and then store your nuts for later. Or you can even chop directly onto a cutting board. With easy assembly and all components dishwasher safe, this is another easy to clean product. 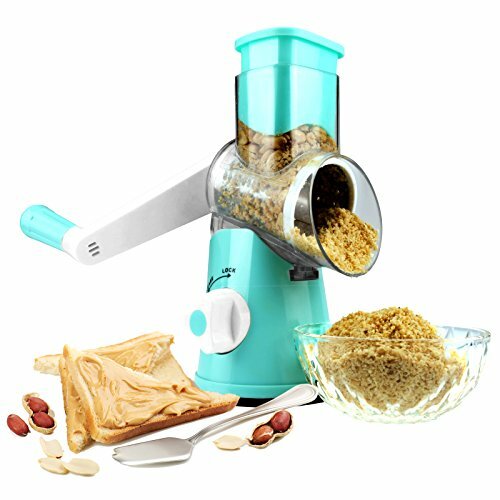 The only downside is that it’s a small chopper, so if you’re looking to do large quantities of nuts, this might not be right for you. So out of all these products, which would I personally choose? It’s a tough choice, and it all comes down to your particular kitchen requirements. I like having my nuts finely minced so I can use them in cooking, so the Round Mandoline Drum Slicer would be my best option. However, if you want something that slices your nuts, then the OXO Good Grips Chopper would be my choice.